Thank you for planning to come to our 27th Annual Holiday Lights Safari Benefit. Please take pride knowing that your admission to this event supports the care and feeding of the hundreds of animals that make their home here at Hollywild. Hollywild is a nonprofit, 501c3 organization. 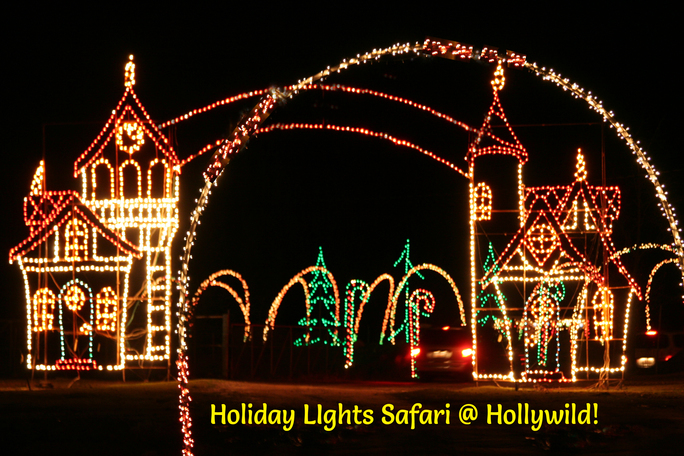 To purchase tickets for the Holiday Lights Safari, our ticket categories are in the box to the right of this information. Additional event details are listed below. If you wish to purchase tickets for our 2017 Park Season, Please click the button below. These make GREAT Holiday Gifts! Lights + Animals + Santa's Village = Incredible Family-Friendly Memory Making, all to help support the hundreds of animals who call Hollywild home. Drive through millions of sparkling Holiday Lights decorating our nearly 100 acre animal park then take some time to stroll in to see Santa and his many animals in the barns at Santa's Village where relaxed fun sets the tone for time with family and friends. Warm your hands or roast marshmallows by the bonfire, and visit Mrs. Claus' attic for an incredible panoramic view of the lights. Snap that selfie with a zebra, camel, or one of many animals waiting to meet you. Finish your evening off with a drive through the peaceful nativity area and more lights displays before heading home. For an additional $10 (a separate ticket or payable at the gate) you can drive through our Enchanted Deer Forest where you hand-feed animals (animal food provided) from the comfort of your car. There you can see and feed Sika and Fallow Deer, zebra, donkeys, and other gentle hoofstock. Nov. 10th & 11th (Fri/Sat): SNEAK PREVIEW NIGHTS! Admissions open 6 pm - 9 pm, event continues after admissions closes for all who have entered by 9 PM. Please note, these two nights are the equivalent of a dress rehearsal for our staff and crew. Nov. 17th - Dec. 7th: Admissions open 6 pm - 9 pm, event continues after admissions closes for all who have entered by 9 PM. Dec. 8th & 9th (Fri/Sat): Admissions open 6 pm - 10 pm, event continues after admissions closes for all who have entered by 10 PM. Dec. 10th - 14th (Sun-Thurs): Admissions open 6 pm - 9 pm, event continues after admissions closes for all who have entered by 9 PM. Dec. 15th & 16th (Fri/Sat): Admissions open 6 pm - 10 pm, event continues after admissions closes for all who have entered by 10 PM. Dec. 21st - 23rd (Thu - Sat): Admissions open 6 pm - 10 pm, event continues after admissions closes for all who have entered by 9 PM. Dec. 24th - 31st: Admissions open 6 pm - 9 pm, event continues after admissions closes for all who have entered by 9 PM. 1) Time to allow: It varies. Once you arrive inside the park, a general guide is 2-3 hours depending upon what areas you visit and how busy we are. Some visitors only plan to drive through the lights (about an hour), but we HIGHLY recommend giving yourself time to stop and walk through Santa's Village (which could add an additional hour or so.) This bonus area does not require extra admission, and allows you to walk through and meet animals in the barns, warm your hands by the bonfire, and take a peek at the panoramic view from Mrs. Claus' Attic. In Santa's Village you have the option to purchase tickets for concessions, animal food, pony rides, and photos with Santa. 2) Advance Purchase of tickets does not provide faster admission to the event. Traffic tends to be lighter on weeknights (Sun-Thurs), and closer to admissions opening at 6 PM. We often see people start lining up at our admissions area around 5:30 PM. All tickets sales are final and non-refundable. You are welcome to pass them along to friends or family. 3) General Admission is per person. Deer Forest Admission is per vehicle. Deer Forest only admission is not available without purchase of general admission tickets or a previously purchased season membership. 4) Weather: If you are concerned about weather related closures, please check Hollywild's Facebook page (www.facebook.com/HollywildAnimalPark/) for any weather related updates to our hours or areas open. On occasion, the bonus areas of Santa's Village and/or the Deer Forest may close for weather. Generally, the drive-through lights will not be closed sue to inclement weather, but it is always wise to check our FB page before coming if you are concerned about the weather. 5) Animal Food is included with the purchase of admission to the Deer Forest and available for purchase at Santa's Village. Due to USDA animal care regulations we are required to follow, visitors may not bring food from outside the park to feed the animals. © 2019 ShowClix on behalf of Hollywild Animal Park. All sales are final. Tickets are non-refundable.